Uttar Pradesh State Road Transport Corporation has rolled out an employment notification named UPSRTC Samvida Bus Conductor Recruitment 2018 - 19. Application through online mode has been invited by the eligible aspirants to apply for the 3171 vacancies for the post of Samvida Bus Conductor. Step 2: Take your cursor towards “Recruitment” link available at the top menu bar if the home page. Step 3: Thereafter hit on the “Moradabad” and “Hardoi” link. Step 4: A PDF file of the UPSRTC Recruitment notification will be opened at your screen, read the notification details carefully. Step 5: Now hit on the “आनलाइन आवेदन पत्र भरे” link, the application form will be opened at your screen. Step 6: Fill the UPSRTC application form in the prescribed format. Step 7: Submit the form and take a print out of the same for the further use. 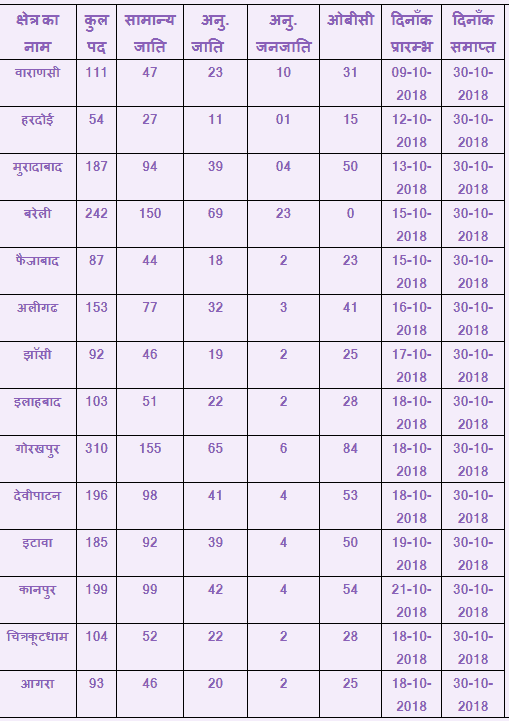 UPSRTC Varanasi Recruitment 2018 notification has been published by the Uttar Pradesh State Road Transport Corporation. According to the notification, there are total 111 vacancies for the post of Samvida bus Conductor. Candidates who want to apply for this post can fill the online application form from 09 October 2018 to 15 October 2018. The online application form is available at the official website of the Uttar Pradesh State Road Transport Corporation. Aspirants who are going to apply are suggested to check the complete eligibility conditions for the UPSRTC Varanasi Recruitment 2018 – 19. The complete details like qualification required, age limit etc are well provided below. After reaching to the home page you have to take your cursor towards “Recruitment” link and hot on “Varanasi” link from the drop-down list. A page will be opened having details regarding UPSRTC Varanasi vacancy. A PDF file of the notification will be opened at your screen read the information carefully. Now go back to the previous page and hot on “आनलाइन आवेदन पत्र भरे” link. Upload documents and submit the form. Finally, take a print out of the filled application form for the further reference.